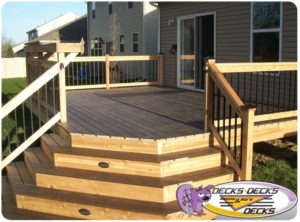 Adding a custom deck to your Omaha home extends living and entertaining space, and increases the value of your home. Often, when Omaha home owners are considering updating their outdoor space they consider adding a deck or patio. Depending on your home, yard and needs – one likely makes more sense than the other; and our Omaha custom deck builders can help you decide if a deck or patio will work best. Adding a custom deck to your home can produce a strong return on investment. By extending your living space to the outdoors, a home’s value and sell-ability increase. And a custom deck built by a professional custom deck builder in Omaha will be a home addition with guaranteed durability and craftsmanship. A deck is also more versatile than a patio. You don’t need level ground and can extend it over a variety of terrain. By choosing a custom deck, installation can be easier, since the structure is built above the ground. This means that tree roots, wet ground, even big slopes can be easily overcome. Also, a custom deck allows for more flexibility creativity in location – including elevated. A custom low-maintenance deck can also provide a safer entertaining/play space for families, as compared to a concrete or brick patio. At Decks, Decks and More Decks our low-maintenance deck materials are splinter free and safe for kids. Additionally, our low-maintenance deck materials come in a variety of colors to match your home. A custom deck is a perfect option to increase usability and versatility of outdoor space. Allow our Omaha custom deck builder help you decide if a custom deck will be your best option. This entry was posted in Custom Decks Omaha and tagged custom decks omaha, deck building omaha, decks omaha on August 9, 2016 by Decks, Decks and More Decks.